You save 1,00 € respectively 25% ✔ Delivery time 1-3 working days within Germany. Known from Tex-Mex cuisine, Body Attack has now expanded its range with versatile tortilla wraps with an extra helping of protein. The Body Attack protein tortilla wraps are not only delicious and rich in protein, they can also be used to create a whole array of different meals. Content is sufficient for use according to our recommendation for 4 day(s). 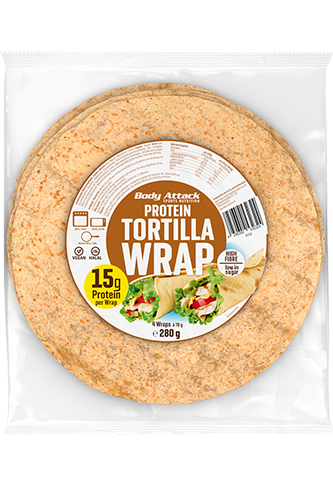 The Body Attack protein tortilla wraps are the ideal alternative to animal-based protein sources such as meat, sausage, egg and milk products. A wrap supplies your body with approx. 16 g of protein, which is as much protein as in 80 g chicken breast or two eggs. And the Body Attack protein tortilla wrap can also keep up with a slice of protein bread, whereby the wrap does not contain any whole grains and creates a pleasant feeling in the mouth. The Body Attack protein wraps are full of natural plant proteins from wheat, lupines and oats. These protein sources are very popular among vegetarians and vegans. For those, who want to eat less animal fat for health reasons, the protein tortilla wrap is also a good alternative. And also athletes, who train nearly every day, will benefit from the protein tortilla wraps, as one wrap (70 g) contains 15.5 of protein and 21 g of carbohydrates, which are important for the muscles and for working out. Due to the low fat content of 6 g per wrap, they are easily digested and an ideal snack for before and during a workout. In this case, however, the topping should also be something light. This makes the wraps simply ideal within the scope of a low-fat diet. The fat contained in the wraps comes from rapeseed oil, which is recommended by nutrition experts because of its optimal ratio of omega-6 to omega-3 fatty acids. Finally, the protein tortilla wrap supplies the body with 8.7 g of fibre per 100 g, which means that the wraps have a high fibre content. According to nutrition experts and scientists this is essential for a healthy and well-balanced diet as fibre plays an important role for blood sugar regulation, saturation and detoxification processes. With its top nutritional values, the Body Attack high protein wrap qualifies as healthy fast food. They can be prepared, packed and eaten in next to no time.